NEW YORK—Keystone Electronics Corp. has introduced a new series of advanced 8P8C modular jacks, suitable for 100Base-T (fast Ethernet) applications, to support the high-speed performance requirements of Gigabit Ethernet applications. 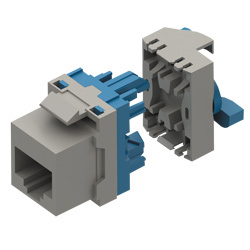 The Keystone RJ45 sockets are manufactured for increased durability and are reported to endure a minimum of 500 insertion cycles. Rated for 125 VAC RMS, the jacks are fully compliant with IEEE and IEC standards. A variety of styles are available to accommodate design applications with numerous mounting and port size options, according to a company release. Keystone Electronics Corp. (keyelco.com) is an ISO 9001:2008 certified manufacturer of interconnect components and hardware. The company, based in Astoria, Queens, provides a full complement of stamping, machining, and assembly services. An in-house application engineering group is on hand to aid in product modifications or customers’ special designs.